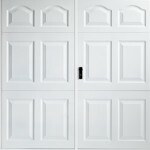 Side Hinged Garage Doors from Samson Doors combine the advantages of eye-catching designs, easy use and pedestrian-friendly access to provide a solution to many of your garage door problems. We supply only leading brand manufacturers for a range of steel, timber and GRP garage doors in standard and purpose made sizes many with the option of a prefitted steel fixing sub frame to make installation as easy as possible. The hinged doors we provide are carefully selected, and have been for over 21 years now, to give the best value for money but the highest possible quality and longevity. So many timber side hinged doors on the internet are just cheap, knotty, softwood doors supplied just as a pair of door panels where you have to then source a fixing sub frame and all the ironmongery - and you will have to be quick before the doors fall apart! 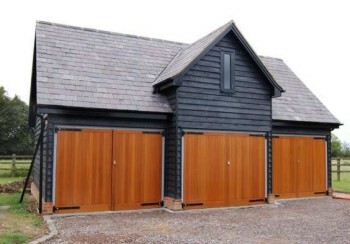 The doors we supply are only of the very highest quality cedarwood, Idigbo timber or in steel and GRP with all the furniture supplied and in many cases fitted along with the fixing sub frame too so all that is required is to offer the complete unit up to the garage opening to secure and adjust. 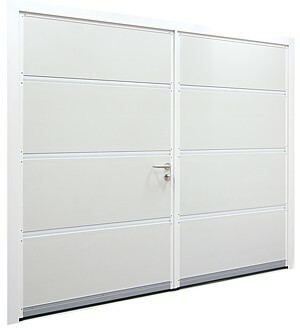 Many people now see side hinged garage doors as not only a firm form of garage door security, but also as a pedestrian access point or store room for various items (such as bikes, tools etc.) thanks to their adaptable bi-parting door panels. 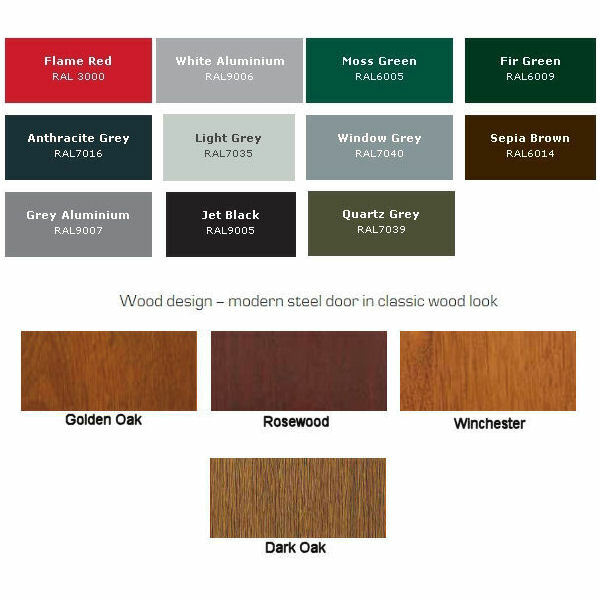 Despite being seen as more of a 'classic' garage door, the side hinged garage door has enjoyed a recent rise in popularity with new high quality designs available from leading manufacturers such as Garador, Cedar Doors, Carteck and Woodrite Doors. 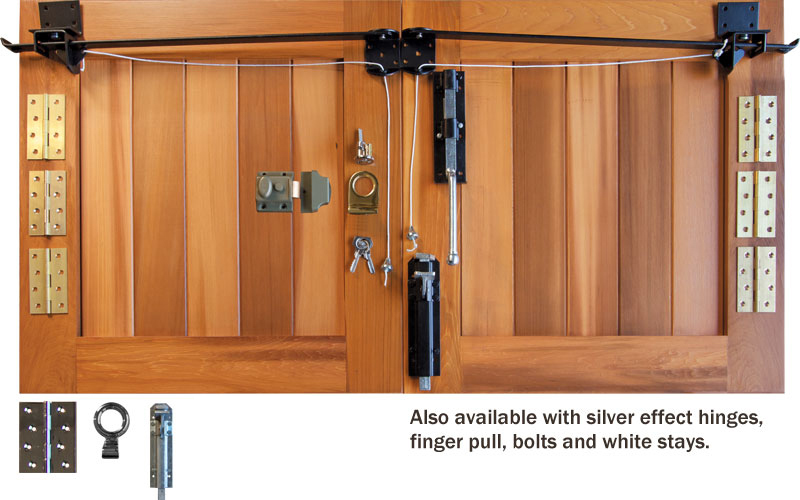 The side-hinged garage door has very little installation requirements. In fact the only requirements are the space needed to swing open and wall-space to fix the metal hinges and timber or steel sub frame. Nothing inside the garage is really ever a problem stopping anyone having the hinged door option. This recent rise in new designs includes various door panel designs two new door opening style varieties; 50/50 opening or 2/3 opening. 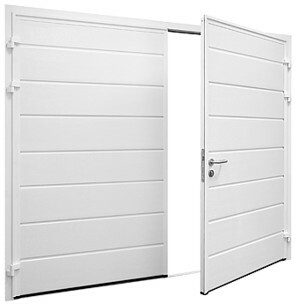 A 50/50 opening is an even half-and-half garage door which bi-parts from the middle however a 2/3 opening side-hinged door offers a large and small half door panel. 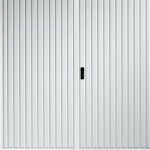 Samson offer hinged garage doors for domestic use constructed from either galvanised steel, timber and GRP generally available up to 8 feet wide and 8 feet high (2.438 x 2.438). They can be produced with or without a timber or steel fixing sub frame for installation and are available with a multitude of locking and handle arrangements. Timber side hinged doors still remain one of the most flexible options in terms of designs and sizes with almost any minor or major design variations available as well as a choice of different timber species such as cedar, oak, iroko, douglas fir and others. Not what you're looking for? 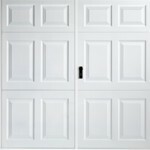 View the rest of our Side Hinged Garage Doors in our Online Shop! All side hinged doors can be easily automated using one of several automation systems available, all tried and well tested. 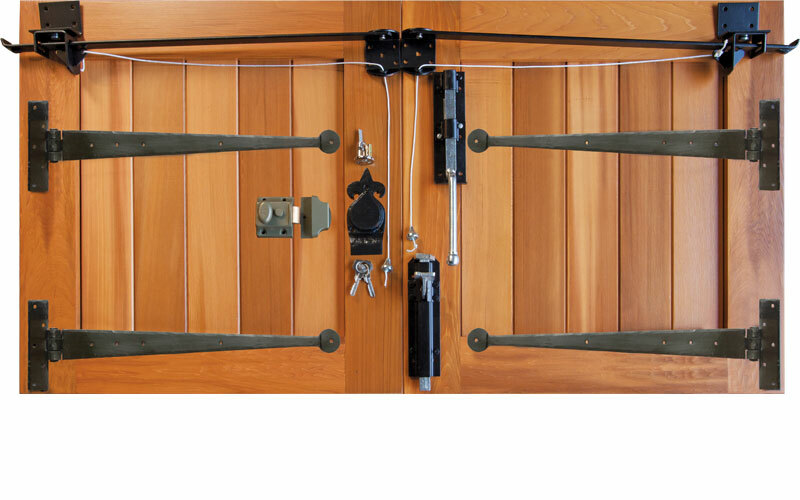 It is not possible or recommended however to automate a cheap pair of existing softwood garage doors as there is insufficient strength is the railing and timber generally and this will lead to twisting, splitting and warping all too easily. All the steel, timber and GRP side hinged doors that Samson Doors supply can be automated and we generally quote on an individual basis as there are so many variables in the equipment required as well as the access control methods. 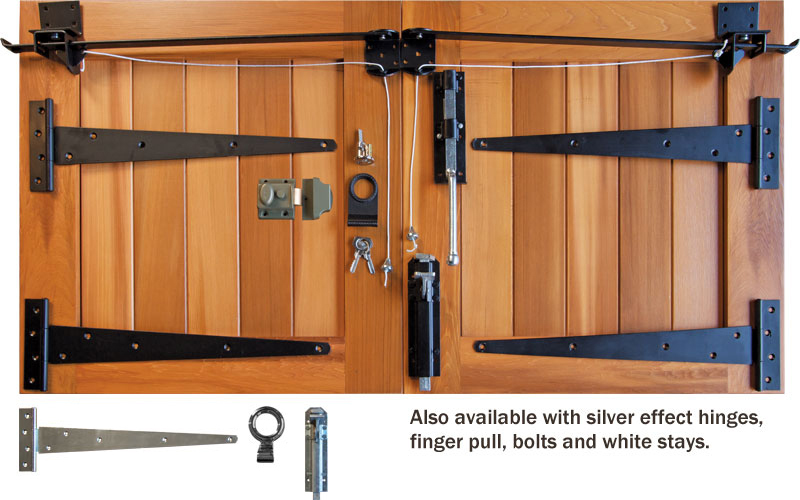 A good quality reasonably powerful boom style garage door operator combined with a special conversion kit is the most popular method of automation as it is simple, well priced and very reliable. You can choose from several models of electric operator capable of doing this job, Hormann, Marantec and Seip are generally the main ones to use. Steel rods push and pull the garage door panels from the very top to open and close the doors with one door always closing before the other. This method is generally fine for doors up to a total width of 3 metres and once over that width you have to start to look at hinged gate type operators using hydraulic or mechanical rams offering higher power and the ability to open wider doors. We can offer this equipment from manufacturers such as BFT, FAAC, CAME and Hormann. Again the various models available mean we quote on an individual basis in order to ensure the correct model is used and controlled correctly. NEW!! 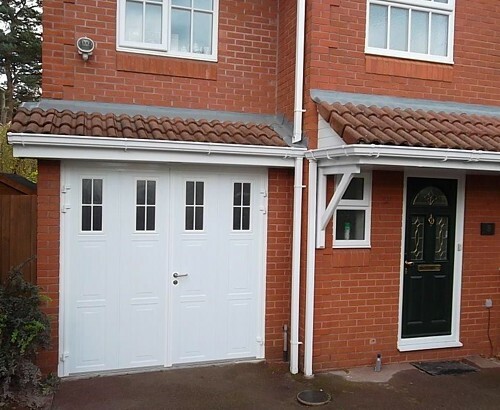 - Insulated Side Hinged Garage Doors from Carteck. 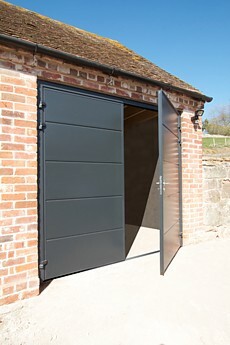 German manufacturer and leading sectional door company Carteck (Teckentrup in Europe) have developed a range of superb double skinned insulated steel side hinged garage doors to offer a made to order garage door system offering insulation, security, weathersealing and a very wide range of colours, finishes and glazing options. The Carteck insulated side hinged range is manufactured in made to measure sizes up to 2500mm wide covering over 90% of all side hinged door size requirements and many of the doors can be supplied in an asymmetric configuration if required to give a true pedestrian access door leaf. 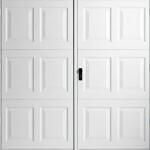 Now available are the matching Personnel Doors, ideal if you have a free standing garage, or larger garages with additional side access. 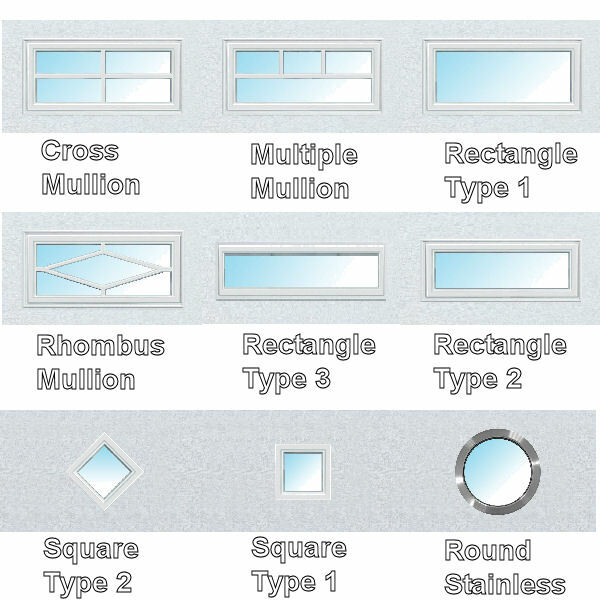 Every side hinged door set is supplied with an aluminium fixing sub frame which has the insulated door leaves pre hung complete with a double rebated edge fitted with rubber weatherseals, including a threshold for maximum sealing potential on site. The stainless steel handle set is standard as is the doors stays fitted to hold the doors open in windy conditions. Choose your design, choose your colour, order as the overall frame width and height and your perfect side hinged door system will be delivered for an easy on site installation. Installation is also available from our teams of installers if required, prices on application. The Carteck insulated doors are perfect for workshops, playrooms, offices, gymnasiums, game rooms and all the other hundreds of uses everyone seems to have nowadays for a garage apart from actually putting a vehicle inside. The excellent sealing, insulation and security mean you can rest assured of keeping unwanted weather and visitors out, and warmth, comfort and possessions in.